What would it take to make a solar powered battery charger? It will take some creativity and a step by step instructional guide. The science of solar power is quite simple. The Photovoltaic (PV) cells generate Direct Current (DC) when exposed to direct sunlight. The more sun you give it, the more power it will produce. To run your household appliances, you will need to convert the Direct Current to Alternate Current (AC). To do this, you will need a device known as a power inverter. If you are planning to use solar power to charge a conventional rechargeable battery, the PV cells may work just fine. Many DC powered equipment such as notebook, cell phone, Ipod for instance, run on DC power from the battery. AA batteries are a good fit for charging with solar cells, since they have a low voltage of just 1.5 volts per battery and don’t take long to charge. A rechargeable 1.5V AA battery will typically have a storage capacity of around 1600 milliamp hours (mAh). Just as you need around 16 ‐ 18V to charge a 12V battery, you also need more voltage from your solar battery charger than the battery will provide in order to force the extra current into the battery, thereby charging it. Using water as an analogy, envision two pipes with flowing water meeting up in the middle. Voltage is comparable to the pressure of the water. If the water pressure is higher in pipe A than in pipe B the water will flow from pipe A to pipe B. If pipe B’s pressure is higher than pipe A, the water will flow from pipe B to pipe A. To charge a 12V battery, you need to supply more “pressure” to it (a higher voltage) to force the current into the battery cell and charge it. Current can be compared to the amount of water that is flowing. 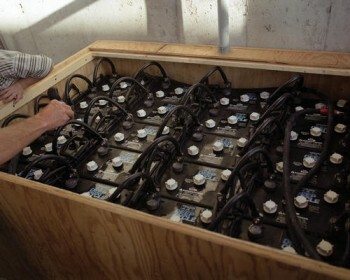 Think of a battery like a water tank. If the pressure going into the tank is higher than the pressure coming out of the tank then you will fill the tank with water. Depending on how much water is flowing dictates how fast the tank will fill up. Likewise, it is dependent on how much current is flowing from the solar panel to determine how fast the battery will fill up with power. Do you want to know how to use solar power to reduce your home monthly electricity bill? If you do, check out the 30 Solar and Wind Power For Homes Videos e-book. It is free to download. Just click on the link below. ==> Click here for instant download!